Investigators have revealed that the substance used to attack former Russian spy Sergei Skripal and his daughter Yulia Skripal in Salisbury, UK, was a nerve agent. However, exactly which chemical agent was used has not yet been disclosed. The pair were discovered slumped on a bench in the city’s Maltings shopping centre on 4 March, and are both still critically ill in hospital. A police officer who was one of the first to respond to the incident is also being treated in intensive care. Assistant commissioner Mark Rowley, head of counter terrorism policing at the Metropolitan Police, says scientists have identified the substance used. ‘Having established that they were exposed to a nerve agent we are now treating this as a major incident involving an attempted murder,’ he said in a statement. No details on which nerve agent was used have been given. An anonymous source told BBC News it is not VX – the chemical used to assassinate North Korean leader Kim Jong-un’s estranged half-brother Kim Jong-nam in a Malaysian airport in 2017. The source also said it was likely to be rarer than sarin, made infamous by its recent use by government forces to attack rebels in Syria. The process of identifying what was used to poison the Skripals has involved both medical and analytical scientists, says Alastair Hay, a professor of environmental toxicology at the University of Leeds, UK. The patients would have been screened for exposure to various poisons when they were taken to hospital by testing body fluids such as blood and urine. Blood tests can flag up reduced activity of acetylcholinesterase – the enzyme that nerve agents bind to – so this, combined with an assessment of symptoms, would have revealed the nature of the toxic substance. To identify which nerve agent the authorities were dealing with would have then required analytical techniques like gas-chromatography mass-spectrometry or HPLC mass spectrometry. This work was carried out at the UK’s defence laboratory at Porton Down using samples of the agent isolated from the victims’ blood. ‘There’s another enzyme in blood called butyrylcholinesterase that is also inhibited by nerve agents and acts as a sort of reservoir, so you can extract the chemical from the enzyme and then do your analysis,’ Hay says. Porton Down, he adds, has a huge library of compounds to compare sample spectra to, so this is likely to be how it was ultimately identified. Now, the investigation has moved on to trying to establish where the nerve agent came from and how it was administered. Investigators wearing hazmat suits have been seen searching Sergei Skripal’s house and car for evidence, and parts of Salisbury city centre near where the victims collapsed remain cordoned off. ‘Finding out where they were exposed will help with the investigation of who may have supplied [the nerve agent],’ says Hay. For this kind of analysis, he adds, it is crucial to find environmental samples, as traces from body fluids are just too small. All nerve agents work in a similar way, by binding to cholinesterase enzymes and preventing them hydrolysing the neurotransmitter acetylcholine, shutting down thecentral nervous system. Symptoms include disorientation, muscle spasms, breathing difficulties and a general shutdown in body functions that can lead to death if left untreated. There has been no word yet from the police on when or how the Skripals were exposed to the nerve agent. The hospitalisation of the police officer and symptoms reported by other first responders – including itchy eyes and breathing difficulties – suggest it could have been inhaled or administered by skin contact. Police say there is no danger to the public, although a nearby restaurant and pub, which the victims visited before they were found, have been cordoned off. Earlier this week the fire service was seen hosing down the area to wash away any soluble contaminants. 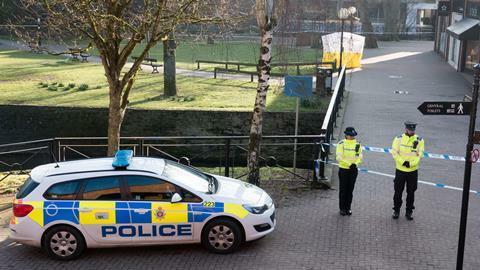 Investigators are now working to trace where the nerve agent came from. Most nerve agents aren’t easy to synthesise and have to be made in a laboratory with specialist equipment. By analysing the agent used in this case it may be possible to trace the country – or even the lab – in which it was made. The attack has been widely compared to the killing of Russian dissident Alexander Litvinenko who was poisoned with a lethal dose of polonium-210 in 2006. A public enquiry published 10 years after the attack said it was carried out by Russian agents, likely acting on the orders of President Putin. Skripal would appear to be an unusual target for the Russian authorities, however. A now-retired former intelligence officer, he was jailed in Russia in 2006 for passing information to MI6, but released in 2010 as part of a ‘spy swap’ and has lived a quiet life in the UK ever since. Yulia, who lives in Moscow, was visiting her father in Salisbury at the time of the attack. Over the past decade, there have been a number of deaths on British soil of Russians who have fallen foul of Moscow, of whom Livinenko was the most high profile.